Following on from their recent releases of the fully restored and re-mastered Hammer classics, The Reptile and The Plague of the Zombies last June, Studiocanal have announced the release of the next three iconic Hammer titles in their new restoration series in October: The Mummy's Shroud, Rasputin the Mad Monk and our favourite Hammer film of all, The Devil Rides Out. Directed by John Gilling (The Reptile, The Plague of the Zombies) and starring André Morell (Bernard Quatermass in the TV original of Quatermass and the Pit), John Phillips, David Buck and Elizabeth Sellars, and with support from Roger Delgado (the original The Master on Dr. Who) and Hammer regular Michael Ripper, Hammer's The Mummy's Shroud has gained cult notoriety for its gruesome murder sequences and its striking climax. In pre-revolution St Petersburg, Russia, sinister monk Grigori Rasputin provesthat he has the unearthly power to ease the deranged and heal the sick, but at what price? Aided by his hypnotic powers Rasputin begins his ruthless and depraved pursuit of power and wealth, determined to give God sins worth forgiving. He must be stopped, but how do you rid the world of a man who defies death? Horror legends Christopher Lee (Dracula Prince of Darkness) and Barbara Shelley (Quatermass And The Pit) star in a controversial film about one of history's most notorious figures. The film was directed by Don Sharp (The Face of Fu Manchu), the film was shot back-to-back with Dracula Prince of Darkness using many of the same cast members and sets. The debonair Duc de Richleau has been trusted with the care of his deceased friend's son, Simon Aron. The Duc discovers that the young man has been seduced into joining a Satanic cult headed by the diabolic Mocata, who is intent on making Simon one of the Devil's disciples. Having rescued Simon from a bloodied ritual, de Richleau is pursued by Mocata, who will stop at nothing to destroy the Duc and his friends, even summoning the Angel of Death itself. Starring Christopher Lee in one of his personal favourite roles and based on the celebrated novel by Dennis Weatley, with stirling support from Charles Gray, Nike Arrighi, Leon Greene and Patrick Mower, The Devil Rides Out is one of Hammer's most accomplished and thrilling mystery horrors. 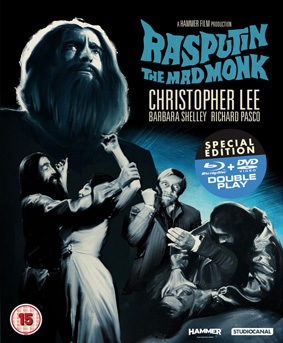 The Mummy's Shroud, Rasputin the Mad Monk and The Devil Rides Out will be released individually on double play (containing Blu-ray and DVD editions) by Studiocanal on 22nd October 2012 at the RRP of £22.99 each.